SOUTH KOREA: North Korea has launched its annual Arirang festival, featuring tens of thousands of performers in a highly-choreographed display of patriotism and support for the ruling Kim dynasty. 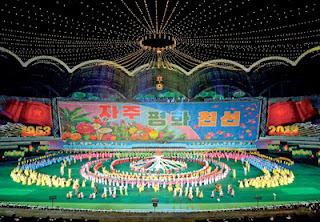 This year's mass games opened in Pyongyang's 150,000-capacity May Day stadium on Monday evening with a theme that focused on the 60th anniversary of the armistice suspending hostilities in the 1950-53 Korean War. The conflict is referred to in North Korea as the "Fatherland Liberation War", and the signing of the armistice on July 27 is celebrated as "Victory Day". The Arirang festival, named after a famous Korean folk song, is an extravaganza of song, dance, rhythmic gymnastics and mass calisthenics. The show is played out against a constantly-changing backdrop provided by an entire bank of the stadium, where participants wield giant flashcards to create complex mosaics with a patriotic flavour. "Spectacular scenes were presented, depicting heroic soldiers during the Fatherland Liberation War backed by effects of the colourful light rhythms, lighting and flame fireworks," Pyongyang's official Korean Central News Agency said in its report on Monday's performance. KCNA video footage highlighted scenes and slogans praising the North's founding leader Kim Il-Sung, and his son and successor Kim Jong-Il. Current leader Kim Jong-Un, who came to power after his father Kim Jong-Il's death in December 2011, was not named as attending Monday's performance. The festival runs until September 9, with five shows a week. "I'm taking part for the first time. I would like to please General Kim Jong-Un with a successful performance," one costumed participant told KCNA.